Have a great Egypt Travel at Christmas on the land of Pharaohs and enjoy the great offers and the outstanding service from Egypt Travel. Enjoy visiting the Pyramids, sailing aboard Nile Cruise to the gigantic Karnak and Luxor Temple in Luxor. Visit the exciting places in Aswan..
Egypt Travel representative will meet & assist you upon your arrival at Cairo International Airport. After that you will be transferred to your hotel in Cairo by a private air-conditioned vehicle. Upon arrival at the hotel he will do your check in and give you detailed information concerning your tomorrows trip. Overnight in Cairo. Breakfast at your hotel in Cairo, checkout, then met by your personal guide who will accompany you to Giza Plateau to visit the Great Pyramids of Cheops, Chefren and Mykerinus - Famous Sphinx and Valley temple facing the great statue. Additional visit to the Solar Boat infront of Cheops Pyramid (extra ticket on spot) and then proceed to Sakkara area to visit Sakkara Complex and first pyramid ever built (Djoser Pyramid). Move to Memphis; Old kingdom's capital and famous Necropolis. In the evening transfer to Aswan station taking sleeper train to Aswan. Disembarkation after breakfast, pay a visit to the West Bank of the River Nile in Luxor to the Valley of the Kings, the temple of Queen Hatshepsut at El Deir EL Bahari and the Colossi Memnon. In the evening transfer to Luxor station taking sleeping train to Luxor about 11 hours far from Cairo. Breakfast aboard the train and then arrive Giza train station, meet & assist by Egypt Travel REP and transfer to your hotel - check in and overnight. Optional tour in Cairo to visit the Cairo tower and then proceed to the Pharaonic village. 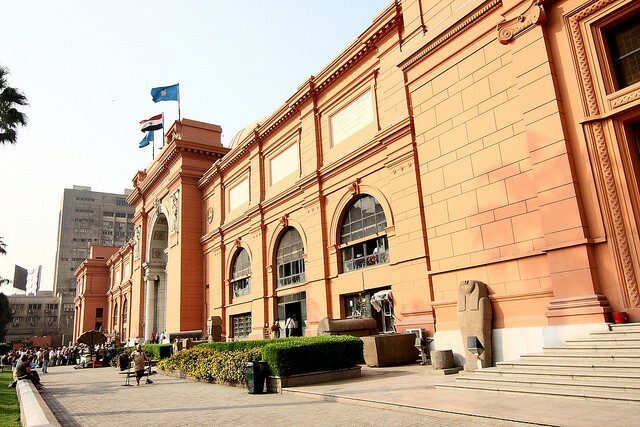 After breakfast, you will be escorted by your private guide to visit: Egyptian Museum, Treasures room for the child king Tutankhamen, alongside many other fascinating artifacts. Additional visit to the mummies room at the museum (extra ticket on spot) Lunch through out the tour at local restaurant, then moving to visit Saladin Citadel including Mohamed Ali Alabaster Mosque inside. Continue to Coptic Cairo to visit the Hanging Church and Ben Ezra Synagogue. Combining fascinating history with shopping in a lively Khan El Khalili Bazaar, which dates back to 1382. All transfers by Private A/C vehicle. Accommodation 3 nights in Cairo, breakfast included. Accommodation for 2 nights on sleeping train including breakfast & dinner. Accommodation 3 nights Nile Cruise, 5cruise with full board. Entrance fees to the mentioned sites in the itinerary. Lunch meal at quality local restaurant during tours in Cairo. Free cell phone (charged with 10 L.E, 2 international or 30 local minutes). * Prices Prices are quoted in US Dollars per person per trip and valid for Christmas, New Years holidays. * Egypt Entry Visa You need to have a valid passport at least 6 months beyond your scheduled return date to enter Egypt and you can obtain a visa from the Egyptian Consulate before departure. Also, entry visa is available upon arrival Egypt airports against USD 15 per passport for specific nationalities and need to check before * Tipping It is a customary attitude for expressing ones satisfaction of good services rendered to him by staff on duty with him. We advise if you are willing to offer it, this would be great and if not, you are not obliged to do it.